There is no night and day. Once upon a time, not so long ago, I was awake throughout the day and I slept during the night. I moved throughout the day and was still during the night. The two were totally separate; as stark a contrast as light and dark. And then baby bean was born, and all at once, light was thrown into my world in more ways than one...the edges of day and night started to merge together into a blurry grey smudge. You see, I had birthed The Great Unsleeper. I knew nothing of tiredness before motherhood. The kind of tiredness that saps your body of strength; that throws its arms around you and just keeps squeezing...where you feel like the air is running out of oxygen and you forget which way is up. The kind of tiredness which almost makes you loose yourself. You find yourself when you need it most; you find yourself during darkness. Because our darkest hours are actually scattered with stars; with gems of pure love. In this time that I once termed 'night', quietness rules. There is no sound in the world besides baby bean’s soft breath and my own steady heartbeat. In honesty, there have been moments in which I felt isolated, scared and incapable during these dark hours. But these have been momentary flashes of doubt amid the darkness. Because when I stop and look at my beautiful girl’s profile against the shadow-like beams of light lingering in our bedroom, I understand that I have all that she needs; that I am all that she needs. I understand that I am enough. Nestled safely in my arms, she does not need light or direction to nurse. Resting her head on my shoulder as we sway forwards and backwards in our rocking chair, she does not need daylight to feel safe and content. Little bean and I do not race through this notion of 'night', because for us, there is just light and dark, and there is beauty and connection in each. As we sit rocking, cuddling, nursing, I imagine the hundreds of hours that we must have spent in this peaceful state. I imagine us rocking across great distances, to other countries and cultures. I imagine us meeting versions of ourselves at each destination, all these miles from home. A mother. A baby. Connected in darkness. I imagine us rocking through time, backwards and forwards. I imagine us glimpsing versions of ourselves wherever we land, be it hundreds or even thousands of years away from here. A mother. A baby. Connected in darkness. You see, in truth, little bean and I are not alone once the moon rises; we are part of a bigger picture, a louder heartbeat, a stronger pulse. Mothers. Babies. Connected in darkness. Because for us, there is no night. Sign up here for the FREE 7 Days Of Sleep Relief email series! 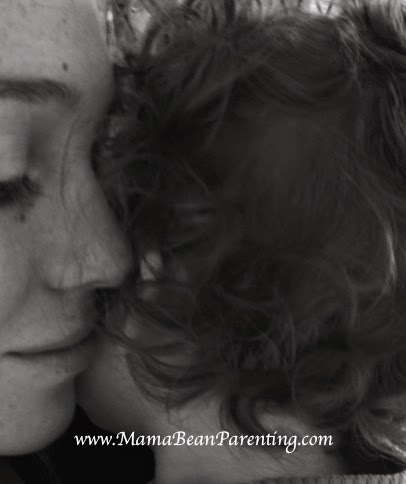 Mama Bean’s Sleep Relief email series shifts our focus away from baby and towards mom…because really, it’s mom who needs support, solidarity and sisterhood. It’s mom who needs to hear that she isn’t the only one awake at 3am with a toddler systematically patting her face. The series offers a short message of solidarity each day, for 7 days. It’s a way of uniting us that works within our unique lifestyles – unobtrusive and not overbearing – just a hand on the shoulder or a whisper of support in the ear. Fill your mommy cup and join the sisterhood today! Oh my goodness this is just beautiful. Thank you Mama Bean!! You've given me 'light' and hope in my tiredness!! Love your blog. Thank you Becca, I'm truly humbled! So glad you like it! I second what Becca just said. This post is one among many wonderful entries. It was beautifully written. Thank you for the reminder that my unsleeper and I are also part of the stronger pulse of mamas and babies. This is beautiful. Simply beautiful. So beautifully written! And exactly what I needed! Thank you! So proud of you. You write beautifully, finding words to express how so many mamas feel and offering reassurance that we are ( or were, in my case) not alone.